I was regularly taking part in conferences related to my area of expertise. On some of them as an attendee, but on some of them as well as a speaker. Later on (in 1998) achieved Microsoft Certified Systems Engineer certificate. 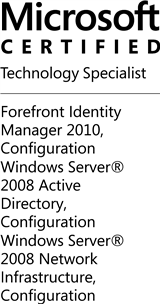 Currently I hold as well Microsoft Certified Technology Specialist certificates including these related to Identity Management area. Warsaw University (Uniwersytet Warszawski), Warsaw, Poland.